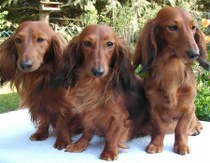 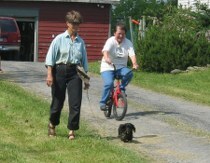 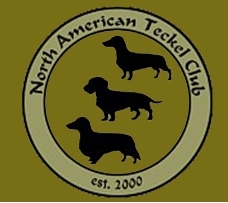 The North American Teckel Club (NATC) was formed in the fall 1999 and its first election was held on March 11, 2000. 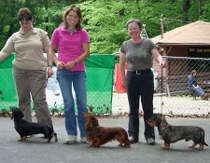 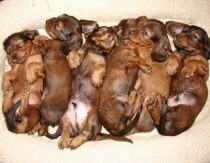 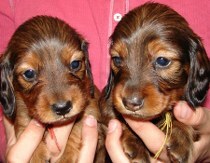 You may ask - why do we need yet another dachshund club? 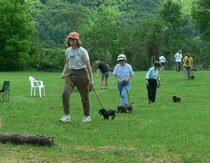 The NATC members consider the dachshund to be a serious hunting dog and the club's mission is to maintain the physical and mental hunting aptitudes of the breed and to test these qualities in the field. 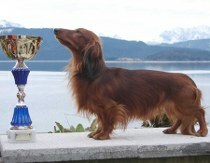 We are dedicated to preserving the dachshund's hunting heritage, to promote its usefulness in the field and to support the breeding of dachshunds with sound bodies and stable temperaments. 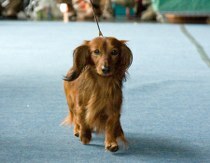 We believe the dachshund should combine functional soundness with an aesthetically pleasing appearance that avoids extremes. 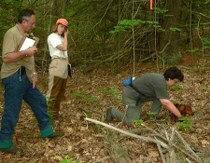 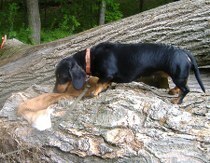 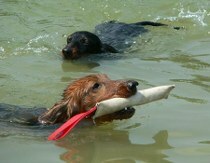 Hunting qualities are an integral part of the complete dachshund. 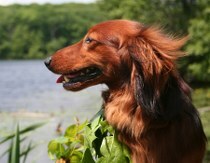 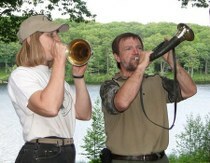 Hunting desire and a fine nose must be combined with intelligence, physical fitness, agility and obedience. 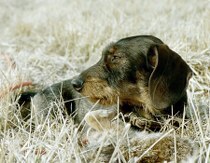 NATC promotes these characteristics and the friendly temperaments and eagerness to please so desirable in dogs that are both hunters and family companions. 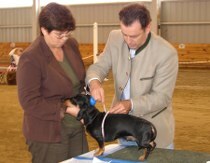 At the Zuchtschau 2001 breeders were provided with opportunity to have their dogs evaluated by the DTK Chief Breed Warden Hans Woerdemann. 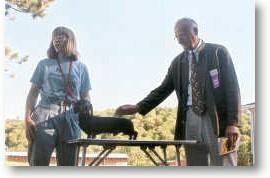 Carrie Hamilton pictured with one of her minis.